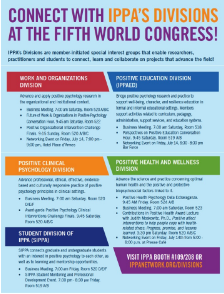 Connect with IPPA’s Professional and Student Divisions at the Fifth World Congress! IPPA’s Divisions are member-initiated special interest groups that enable researchers, practitioners and students to connect, learn and collaborate on projects that advance the field! Congress attendees are invited to attend all division events listed on the flyer and online program. Click the image to view and download the flyer. The Work & Organizations Division would like to invite you to a social hour during the Fifth World Congress on Positive Psychology! Your registration will include access to the social hour where division members can converse on subjects of mutual interest and sample a few Montreal Specialties including mini poutines, grilled cheeses, and smoked meat sandwiches. The Work & Organizations Division Social Hour will be held at the Le Place D’Armes Hotel & Suites on Friday, July 14, 2017 from 7-9pm. Drinks will be available for purchase. Once you register, you will receive a confirmation email. You will pick up your Social Hour badge onsite at the Registration Desk when you arrive for the Fifth World Congress. On behalf of IPPA and the Work & Organizations Division, we look forward to seeing you there! The Student Division of IPPA (SIPPA) has released the full program for their Student Mentoring and Professional Development Event at the Fifth World Congress on Positive Psychology. The event will take place on Friday, July 14, from 19:00-20:30. UPDATE: Registration for this event is currently full. Please plan to connect with SIPPA at the division’s business meeting on Friday morning at 7:00 am in Room 520 D/E/F and at the IPPA booth #109/208. For information about SIPPA’s year-round mentoring program, click here.